Last week when my son was sick, I needed a fast meal that my husband could eat on his way to work. These burritos took about 20 minutes from start to finish (even I was surprised at how fast it went!) When you are making these, you may want more salsa (I only had 1 cup on hand) or to add some of your favorite toppings. As an added bonus, these are awesome warmed up in the microwave, so you can enjoy the leftovers when you are exhausted from taking care of a sick 3 year old or you can send them to work with your husband. In a skillet or pot, brown beef with onion. Season with salt and pepper. Meanwhile, cook the rice and drain the beans. Once the beef is fully cooked, stir in the rice, beans, and salsa; heat through. Microwave the tortillas for 20 seconds to soften. Place filling in the center of each tortilla, top with about 2 tbsp of cheese and diced avocados. Serve immediately or wrap in cling wrap and heat for about a minute in the microwave for a nice lunch to go. 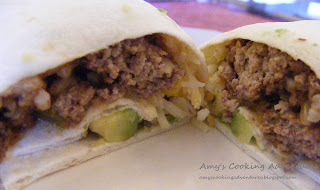 Great dinner idea, thanks so much for the idea, we all love burritos, can't wait to try your recipe, thanks.